I have never use python language. Done d basics in c…Should I start python too? Or continue wd c ? Thanks. I have never used python language. Done d basics in c…Should I start python too? Or continue wd c ? Thanks. It is good to hear that you have done the basics of C, because if you know C well it becomes easier to learn Python or any other programming language. The syntax of python programming language is really simple. C is a procedural programming language and Python is object oriented programming language. So before starting with object oriented programming one should learn procedural programming. Since you have done the basics of C, so I don’t think you’ll face problem understanding object oriented programming 🙂 .If you are really interested, you can start learning Python. You can start learning Python here http://www.codecademy.com and use Python documentation as reference. For python only? Okay. I just need smthing where I can have a step by step tutorial..like a classroom teaching. So the point is that if only one parameter is needed to be choosen then grouping of arguments should be used. Otherwise simple adding arguments to a parser will work. 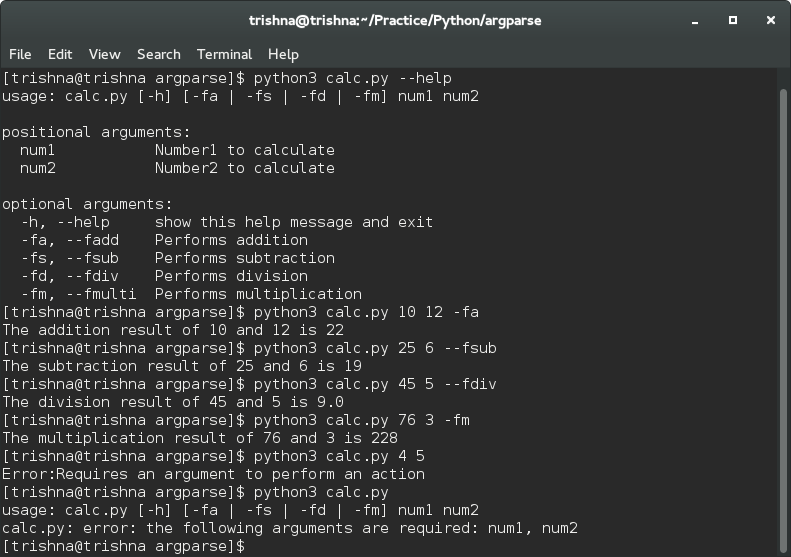 That for example allows to calculate with different operators at the same time: ‘python3 calc.py 3 5 -fa -fs’ will work.